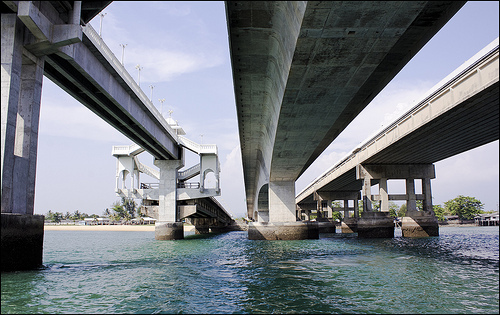 What is commonly referred to as Sarasin Bridge is in fact three bridges over the Pak Prah Strait connecting Phuket Island to Mainland Thailand at Tha Noon in Phang Nga Province. The original Bridge which was named the Sarasin Bridge (after a former Prime Minister) was built in 1967 replacing the old ferry which was once the only vehicle crossing to Phuket. This bridge became famous in Thailand after the double suicide of “Dam and Gew” a Romeo and Juliet style story – him a lowly bus driver and her a student from a very wealthy local family. A Thai Film was made of this story called the Bridge of Love. More about the tragic story here. Over the years the level of traffic crossing to and from the Island has increased massively, this lead to the construction of a second bridge (Thao Thepkrasattri Bridge) around the turn of the Millennium. 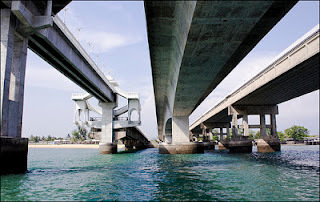 This new bridge was used for all southbound traffic heading on to the Island while Sarasin Bridge then carried the Northbound traffic off the Island. With the original bridge aging, traffic levels increasing and a call from the boating fraternity to allow passage through the strait a new bridge started construction in 2009 and was completed in 2011. This new bridge which lies in between the two older bridges has been named the Thao Srisoonthorn Bridge. It is believed that the Thepkrasattri Bridge was named due to it being on Thepkrasattri Road, however naming the new bridge Srisoothorn links both bridges to Phuket's heritage as these were the Royal names bestowed on Than Puying Chan (wife of the then recently deceased governor of Phuket) and her sister Khun Muk – Phuket's “Heroines” - after they saved Phuket from Burmese invasion in 1785. A statue of these two women, known as the Heroines Monument stands in the centre of a traffic circle on the main highway south of Phuket airport. With the opening of the Srisoonthorn bridge all the northbound traffic has been diverted to the new bridge and the old Sarasin bridge has been closed to traffic and renovated as a pedestrian promenade. As part of the renovations the central section has been raised (to allow boats to pass under) and a viewpoint tower has been added at either end of the raised section. Already this has become a very popular sunset viewpoint for both locals and tourists.